Biryani is a classic rice dish cooked across India. Various proteins are used, including mutton, goat, fish, egg and lentils, although chicken is probably the most common – at least outside India. My version, inspired by a Rick Stein recipe, is delicately spiced but exotic, fragrant with cardamom, saffron and a hint of rosewater. Marinating the chicken for an hour or more makes such a difference to the end result and only requires a little forward planning. 1. Combine the marinade ingredients in a large bowl. Add the chicken and toss to thoroughly coat. Set aside at room temperature for one hour* or refrigerate for longer. 2. Gently warm the milk, rosewater and saffron in a small saucepan and set aside. 3. Add the cloves, cinnamon, cardamom, cumin and bay leaves to a small bowl – this is to ensure that you add the spices to the hot pan all at once, minimising the chance of burning them. 4. Heat the oil in a large frying pan over medium heat and fry the onions until golden, about 10 minutes. Lift the onions out of the oil and set aside. 5. Tip most of the oil out of the pan, leaving about three tablespoons behind. Add the spices and fry for one minute. Add the chicken with the residual marinade and cook for five minutes, stirring frequently. Add the tomato and cook for about 20 minutes until the sauce is clinging to the chicken with a little extra still in the pan. Set aside and keep warm. 6. Boil the rice in salted water for five minutes – it should be a little bit soft but still quite firm. Drain, stir with a fork to separate the grains but don't rinse or refresh. 7. Line the base of a large saucepan (one that will present well on the dining table, and preferably one with a lid) with a third of the rice and a splash of melted butter. Top with half the chicken and sauce. Layer on another third of the rice, half the onions and half the saffron milk. 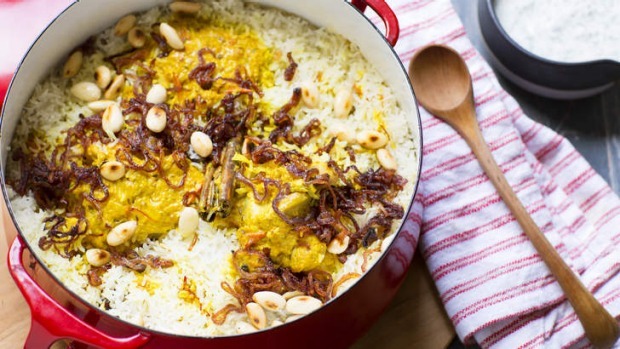 Finish with the remaining chicken, followed by the remaining rice, butter, saffron milk and two tablespoons of boiling water, reserving the remaining onions to finish the biryani. 8. Place the pan over high heat and, watching very carefully. Once you see the first puff of steam move the pan to a small gas jet on low heat. Cover tightly and cook for 30 minutes. 9. While the biryani cooks, make the raita by combining all the ingredients in a bowl. 10. After 30 minutes, remove the lid from the pan and cook for 10 more minutes. 11. Scatter the almonds and remaining onions over the cooked biryani and serve with the raita on the side. 1. Don't be tempted to use chicken breast for this, as the meat will dry out. *2. Marinate the chicken overnight for a deeper, more intense flavour.